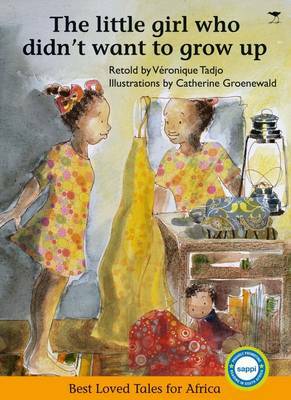 The little girl who didn't want to grow up retold by Veronique Tadjo and illustrated by Catherine Groenewald. Little Ayanda loves her father with all her heart. One day he goes away, and doesn't return. She is so sad that she decides she doesn't want to grow up. So she stays small for a long time, even when her friends tease her. One day her mom gets sick and she changes her mind. She grows bigger so that she can help her family. But when trouble strikes her village, is she big and brave enough to save everyone?